Choose from our many different options to create that special Amish chest built just for you! The Amish Cherry Wood Large Flat Top Hope Chest comes standard with a cedar bottom, front lock, flat top design, and a spring support lid. Customize this Hope Chest with the many options available to you by adding on casters, dovetailed joints, a chest front design, cedar sliding tray and full cedar lining! 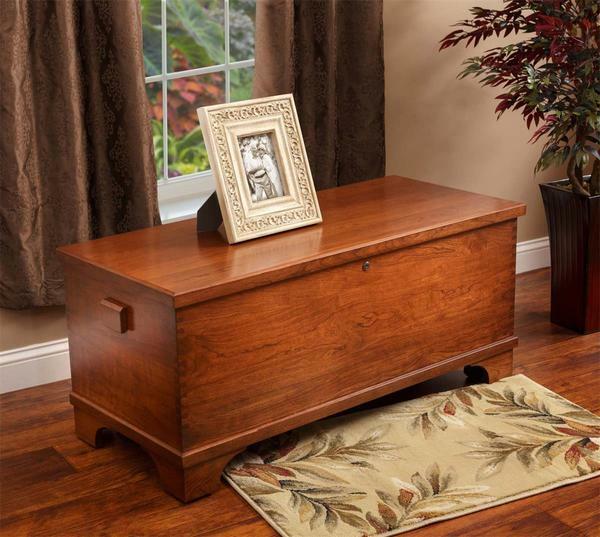 This Amish Chest is proudly made of solid cherry wood in the USA! Please give one of our Amish Furniture Specialists a call at 866-272-6773 if you have any questions or would like some assistance with your order. Our team of professionals will be happy to assist you in any way that they can.